There are many citizens who own a gun for the right reasons. As a gun holder, it is important to realize that gun ownership is a huge responsibility. One of the most significant concerns is how to store the gun and other firearms securely. A carelessly stored firearm can present as much hazard as causing unnecessary accidents or having it turned on you. 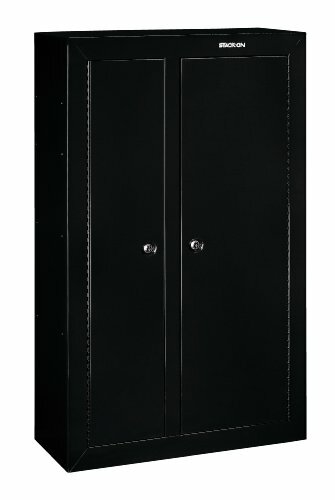 If you own one or several guns for security or hobby reasons, you need a gun safe. Barska is committed to providing superior quality gun safes among other equipment for leisure time adventures (hunting, fishing, bird watching, sporting events, concerts, and stargazing). With a Barska safe, at least you have the peace of mind knowing that your firearm is secure and your residence and all the people who live there are safe. Below, you can read everything you need to know about the best Barska gun safes on the market. This unit is solid, reliable and well built, and it can be used for several years without worry about rust. Proper maintenance measures is recommended, such as wiping the exteriors with the clean, dry cloth to maximize the functionality of the gun safe. Setting up the Barska Quick-Access is a relatively easy process since its biometric system can be set up out of the box. The biometric system can store up to 120 fingerprints, and the fingerprint registration process only takes few seconds. All it takes is just placing the fingers firmly on the scanner, and you are all set. To speed up the scanning process, the scanning finger should be clean from dust, debris and unnatural markings or blisters. 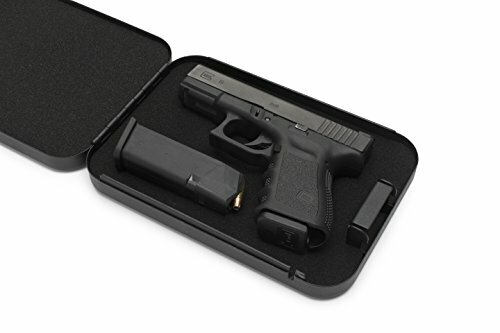 This unit is also an excellent safe for storing valuable items such as jewelry and documents, although it must be said that its compact dimensions limit the number of items. The customers, experts and users also appreciate the manual three point solid deadbolts marking system as an added precaution. Another notable feature of this Barska gun safe is a loud beeping sound when opened. The sound alerts the safe’s owner about two things. First, that somebody else has successfully opened the save and second, it beeps if the safe is left open for few minutes and should be closed. All in all, this safe is a good investment for homeowners who want to keep their firearms in a safe and secure compartment while also giving them easy access whenever needed. This fantastic biometric safe comes with a number of advantages over the traditional combination models, and that is the main reason why several Barska biometric safe buyers opted for this unit. 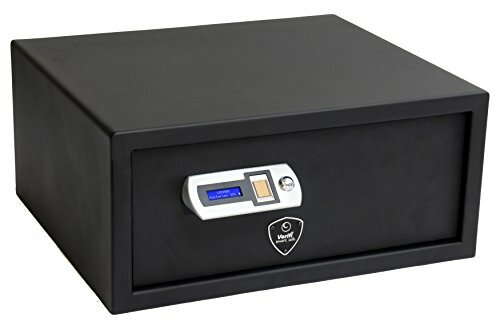 These kinds of safes are considered the best in the biometric category because it provides very quick access to your weapons and other important valuables. It comes with a fingerprint pad, which means that you no longer have to remember long numeric password combination. Moreover, this safe can store multiple fingerprints, so that more individuals in your household can have access to the safe. The programming process is very simple and easy to execute from start to finish. You just place your finger on the scanner, and it will just take a couple of seconds to unlock. 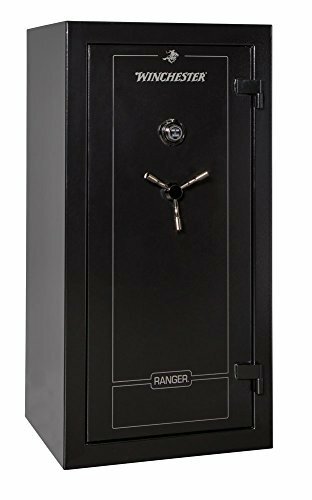 This safe features the perfect size and should fit those who are looking for a small, but a spacious gun safe. Moreover, it will provide more than sufficient storage space for all your valuable items, including your guns. If you leave the safe open, the lights will blink, and after 2 minutes it will also start to beep until you close it. It should be noted that there is no gun holder inside the safe. 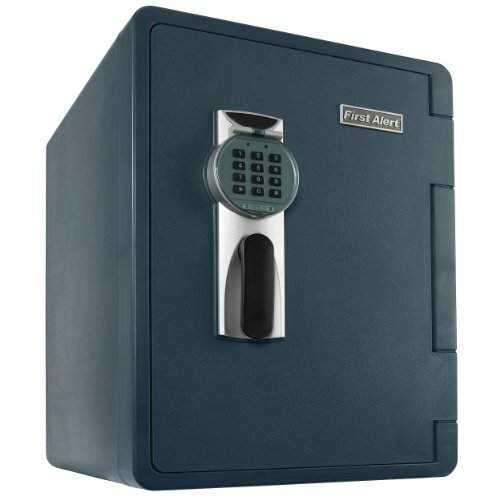 The weight of this safe is 31 pounds, it is not a heavy safe, and it can easily be carried to a different location inside your house. 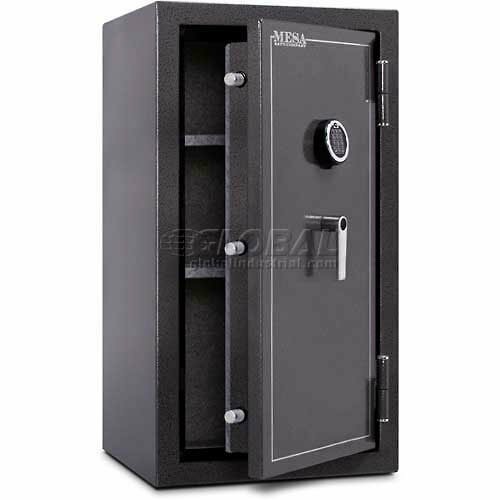 The safe is operated with 4 AA batteries, which can be easily changed. Due to its compact design, it can hide anywhere in your house. The BARSKA Top Opening Biometric Fingerprint Safe marks a revolution in this industry, because of its cutting-edge technology. It features fingerprint security system that can store up to 30 different fingerprints and will open when a stored fingerprint is placed. It also opens with special access keys if the print doesn’t read for any reason. BARSKA uses heavy metal for construction along with a motorized deadbolt lock. The hydraulic door gives quicker access to the stored valuables. This can be mounted on a shelf, countertop or floor, with the help of pre-drilled holes. 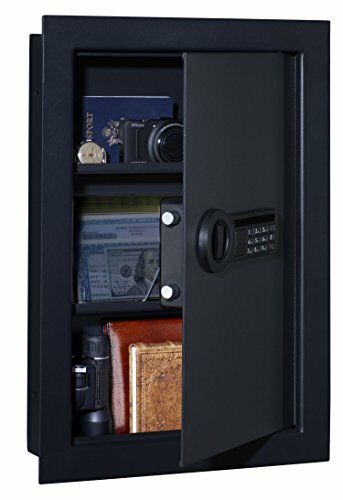 This model features a unique design, and unlike the standard security safes, BARSKA has a top opening with up to 30 unique fingerprint scanning codes to access the safe. It has two sturdy steel locking bolts and motorized deadbolt lock. Additionally, it comes with preventive floor mat, mounting hardware, and emergency keys, plus a user guide for installation and troubleshooting steps. The highlight of this Barska Fingerprint safe is the biometric technology and the top-opening system. The opening feature is ideal if you plan to store the safe in a drawer. Remember, that for ease of usage, the fingerprint scanner should be wiped with a dry cloth regularly. It will require four AA batteries (included in the package), which lasts for an average of 2 years. 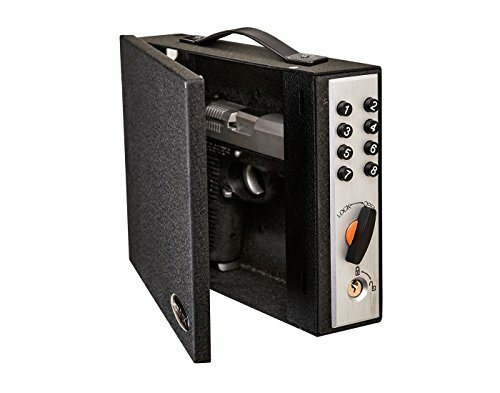 Manufacturers offer a one-year limited warranty, while Amazon provides a 30-day return policy if there is anything that you don’t like about the safe. The Barska AX11620 is ideal to store handguns, along with other sensitive valuables like jewelry and documents. It offers a revolutionary fingerprint locking system, and 30 different users can have access to it. The system is easy-to-use and reads the imprints in seconds. The main features of this unit lie in its compact design. 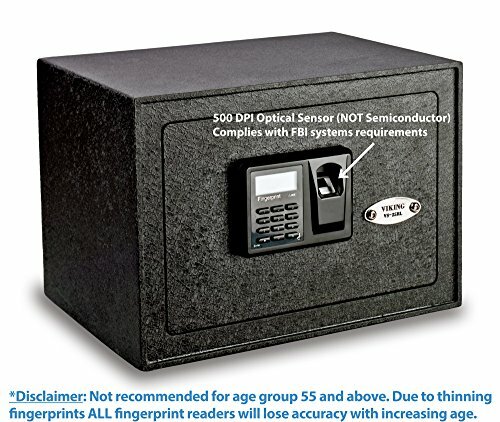 This is a biometric unit that can store up to 30 different fingerprint scans. That way, more people can have access to the safe in an emergency. Moreover, you can also access the safe with the keys that included, if you run into any troubles with the biometric access. This unit is constructed from high-grade steel and comes with pre-drilled holes to mount on a counter top, wall or shelf for added security. It measures 12 L x 8 W x 7.75 H on the outside, and 11.5 L x 7.5 W x 5.75 H on the inside and weighs 15.8 pounds. There are also 4x AA batteries included in the package. Overall, the AX11620 best highlight is the biometric technology. It stores weapons for emergencies and keeps it away from accidents. The emergency keys can work if you run out of batteries. There are lights to guide the processes and indicate a condition. For example, the red light exhibits low battery, which is also easily detected by three constant beep sounds. The manufacturer provides a one-year limited warranty, while there is also a 30-day return policy from Amazon. The first gun safe you can consider purchasing to help you store your firearms in a safe place under lock and key is the BARSKA AX11898 gun safe. It is equipped with an advanced Biometric fingerprint technology which allows up to 120 different users to use their fingerprints to unlock the safe. The technology stores fingerprints for authorized individuals in its internal memory. You don’t need to carry a key or remember a certain password for you to access the safe. All you need is to place your fingerprints on the biometric digital fingerprint scanner to open the safe. This biometric gun safe also comes with a set of emergency backup keys. If for any reason you are unable to open the safe by use of fingerprints, these backup keys will save your day. In addition to safety and access features, this unit maximizes every inch of its internal space for optimum storage. It is equipped with 12 removable storage shelves on the safe space and another one on the inside of the door. You can comfortably organize the shelves and place them wherever you want on the inside of the safe. This unit weighs around 114 lbs and is large and sturdy enough to store your firearms without consuming the entire room space. With this weight, it also means that you don’t have to worry about it being easily stolen by burglars. You can drill the 6 mounting bolts on the unit’s pre-drilled holes to permanently and securely fix the unit into the wall or floor. 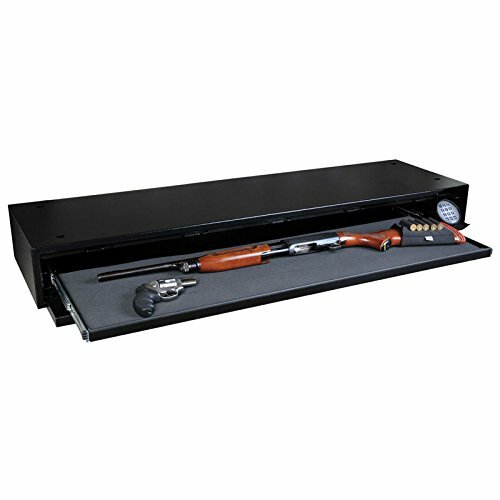 Other appealing features of this gun safe include 4 AA batteries on the biometric locking mechanism, external battery pack, removable racks for storage space and easy to clean steel coated body. Also, the manufacturer backs the unit’s quality with a 1-year limited warranty. 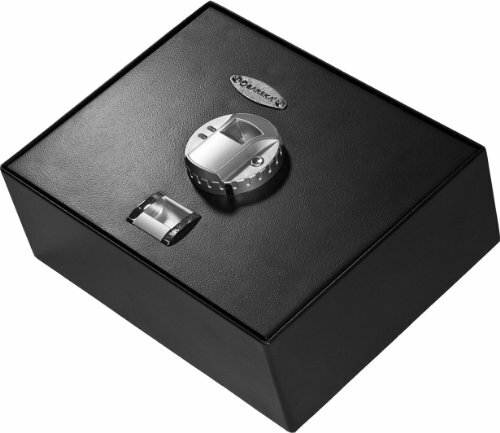 Another biometric safe you can consider purchasing is the BARSKA AX12038 gun safe. 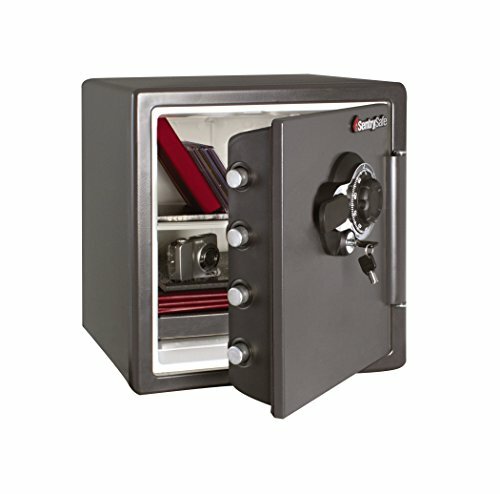 This safe provides you with an extra layer of security for your firearms. To provide maximum security, at a very reasonable price, this Barska gun safe features everything that you need in a gun safe to protect your firearms and most valuable belongings. Just like the AX11898 gun safe, this unit can also be programmed with to 120 different fingerprints. You can store several different versions of your own fingerprints on the safe’s biometric digital fingerprint lock and therefore, make it easier, accurate and safe for the unit to read your fingerprint. Another appealing feature of this unit is the Knob-Locking System. The unit’s door comes with two deadbolts that hold it securely in place for secure locking. The unit has audio beep system to produce signals for various actions being carried on the unit such as low battery power, registering fingerprints, door opening and much more. You can also mute these audio beeps for quiet operation. This gun safe is large enough to safely store several firearms and other valuable items like medicines, passports, important documents and other electronics. It is also equipped with two removable shelves to help you organize various items. When it comes to installation, you don’t need to worry about the place to install the safe. It can be installed behind the furniture, curtains, wall hangings and other places you may prefer. 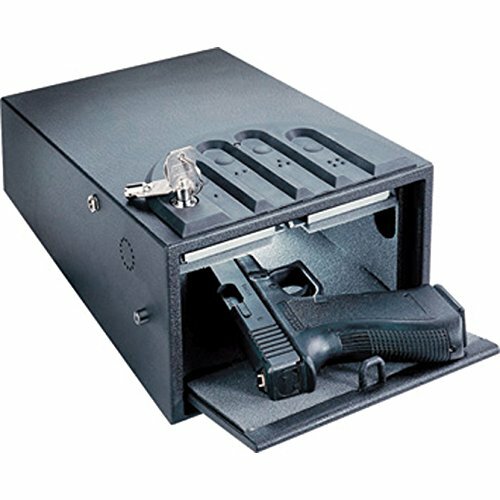 Other appealing features of this gun safe include 4 AA batteries on the biometric locking mechanism and protective mat supply and easy to clean steel coated body. In addition, the manufacturer backs the unit’s quality with a 1-year limited warranty. Barska safes offer a wide range of benefits ranging from highly controlled access to superior protection against theft and damage. Moreover, there are many different gun safes from Braska to suit different demands and needs for storage protection. The Barska team is committed to solve two critical safety issues when making the safes. 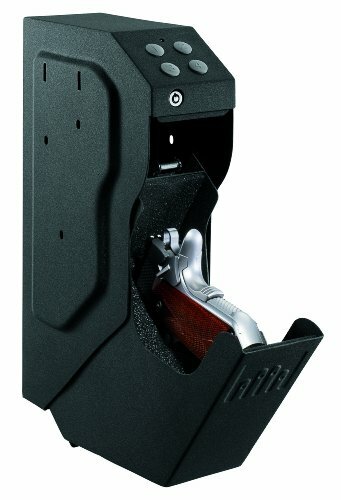 That is to provide maximum security while ensuring quick access to the firearm in an emergency situation. Considering access to the safe, all Barska safes are designed with high-quality material and top class lock technology. Some have keypad locks while others have biometric lock mechanisms. A biometric lock offers you the chance to determine who can have access to the safe. 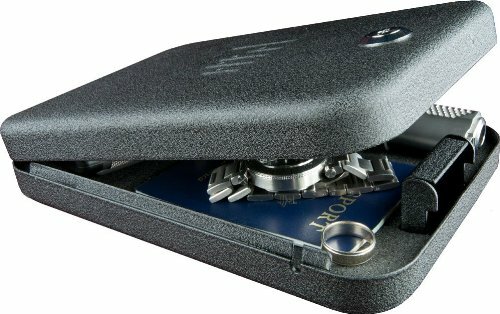 Only those who have their fingers scanned can open the safe, and this keeps your belongings better protected. It is impossible for burglars to gain access to the safe unless it’s a critical situation whereby they force an individual who can open the biometric safe. 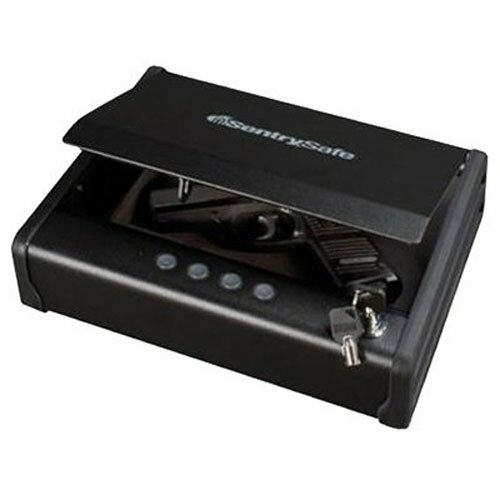 The biometric safe also makes it easier and quicker for authorized people to get the firearm. Barska understands that during an emergency, you need the firearm in a second. You don’t have the time to remember codes or look for keys to open the safe. That’s why the company offers safes with biometric safes at an affordable price. Additionally, the safes can be bolted to a solid surface to ensure that a thief will not take off with the lockbox. Thieves normally won’t have the time or the necessary equipment to uninstall your safe. This is one aspect of gun safes that should be seriously considered. First, it is inherent to recognize that a gun safe is not just an average safe when exposed to fire. When firearms and ammunition gain heat during a fire, bullets can be fired and this can make the safety status of the house worse. Dodging bullets while trying to find your way to safety or when saving life and property is the last thing you would want in a fire situation. Secondly, fires can’t be predicted and they don’t always happen due to carelessness or a mistake. Thirdly, there might be other crucial belongings inside the gun safe such as documents and storage drives. Losing such items in a fire accident can be disastrous. Therefore, you should not overlook the importance of owning a fireproof gun safe. Having said that, Barska fireproof gun safes offer protection to your firearm(s) for up to 1 hour. They are made with strong steel and have a composite fire retardant insulation capability. The guns in a safe can cause damage or get damaged if movement inside the safe is not contained. One of the potential dangers of excessive movement is a drop fire. For most modern guns, this is not a problem as they have drop safety mechanisms. Older guns are less likely to have this mechanism. An old loaded gun can discharge easily if a good jolt happens. Another reason for preventing movements in the safe is to safeguard gun optics. Hunters understand how damage to long gun optics can seriously impede shooting. When you store your firearm in a Barska gun safe, not a single lens will be harmed. Your guns with intricate finishes will also remain protected. Barska also has gun safes with compartments that enable you to store your guns and other items separately. Barska gun safes are available in many different sizes. You might have just a few guns, and you want a small gun safe that can be fixed on the wall or at a small corner on the floor. Or maybe you need a big safe that can accommodate your current or future extensive collection of firearms. You can get any size of a gun safe that will meet your firearm storage needs. Having a large model is advantageous in a number of ways. For instance, if you have a large collection of guns, you can remove one firearm with much ease without having to take others out. Also, you have enough space to store your other valuable items. Some people buy a smaller, commercial-grade lockbox for other items other than firearms and put it inside the gun safe. This is a great idea as this offers double protection. Purchasing a Barska gun safe enables you to abide by the law and avoid undesirable experiences with law enforcers. The gun safes are approved by California Department of Justice after an extensive inspection. DOJ performs multiple tests to ensure that a safe’s design does not have any weaknesses. The inspectors look at the locking system, door hinges, and other aspects of the safe that are considered critical for secure storage of firearms. With a state-approved gun safe, you are compliant with child safety regulations. Also, proper gun storage enables you to avoid the risk of being held accountable for crimes committed with your gun. This is because you determine who uses the gun and prevent thieves from stealing it to commit crimes. There are so many unfortunate cases in the US that involve incorrect handling of firearms. Some involve children playing with a gun and result to shooting accidents that even cause deaths. Do not risk being a victim of state gun law. An investment in a high-quality gun safe is important for the safety of your family, yourself, and the entire society. But gun safes are not the same. It’s clear from Barska gun safe reviews that Barska gun safes have been proven to survive through the most extreme conditions. They have stood the test of time and having one is a life-long investment. There’s nothing safer than a Barska safe.